Acute dissection of the aorta, whatever its type, is certainly the most severe complication concerning the vascular network and should always be considered as a major medico-surgical emergency. 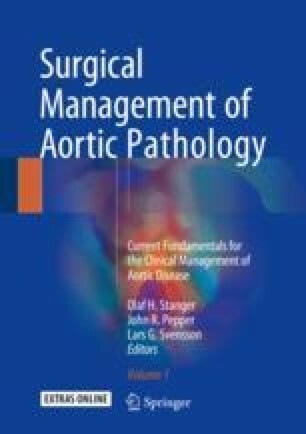 Among the various types of dissection, the ones involving the aortic root and ascending aorta (DeBakey types I and II or Stanford type A) must be diagnosed and surgically treated as soon as possible. The first goal of the surgical procedure is indeed to prevent the patient from dying from severe tamponade; rupture; coronary, cerebral or visceral malperfusion; and major cardiac failure. A second goal appeared more recently and consists in trying to perform the most complete and stable repair in order to prevent the occurrence of late complications leading possibly to reoperations and/or death. The present chapter will consider and describe as well as discuss the methods of cerebral protection that have certainly participated largely in the major improvement of the results of surgery of acute type A dissection, observed in the last decades.